Landscape architects and garden designers can face a challenge when older homes are torn down to make room for larger new homes in well-established neighbourhoods. Municipal bylaws often require a new house to fit in with the existing neighbourhood’s more traditional architectural style. 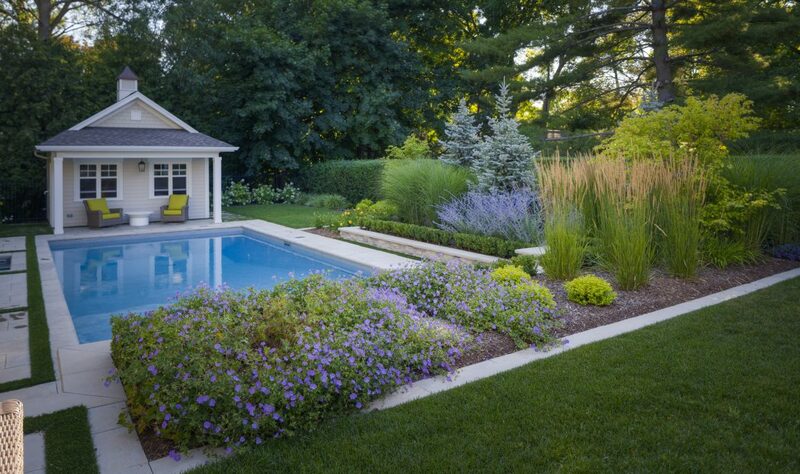 What is less often recognized is that the fit-in consideration can apply to a garden as well. A tear-down and rebuild in historic Niagara-on-the-Lake posed just that challenge to landscape designer Doug Glancy, the owner of Kiva Landscape, a Fonthill-based landscape architecture firm. A Toronto couple bought the tear-down to build what will eventually be their retirement home. Glancy says they settled on a two-storey house with siding, dormers and “an old town feel” – an architectural style more traditional than they may have chosen had the bylaws not restricted their design choices. However, when it came to the property’s landscape, he says, the couple wanted a more modern garden concept than the surrounding properties had. The design features an in-ground swimming pool, a covered porch, a multi-level patio with a bar and outdoor cooking facilities and a pool house. Glancy says he managed to give the couple the kind of contemporary garden they were seeking by adding soft outdoor lighting, long and narrow raised garden beds with trimmed boxwoods, ornamental grasses, flowering shrubs and trees, and architectural elements that blended contemporary and traditional design styles. “We were lucky we had pretty much a clean slate,” says Glancy of the 100-by-200-foot yard. “There was nothing there.” A five-foot slope from the back of the house to the very back of the property was the only thing that required some extra consideration. The new multi-level patio uses the slope to its advantage. The patio starts in the covered porch directly behind the house and drops down one level to the outdoor kitchen and bar, then drops down yet another level to the pool and sun patio. On the pool level, precast concrete slabs were used along with artificial turf to create a geometric pattern in stone and grass. 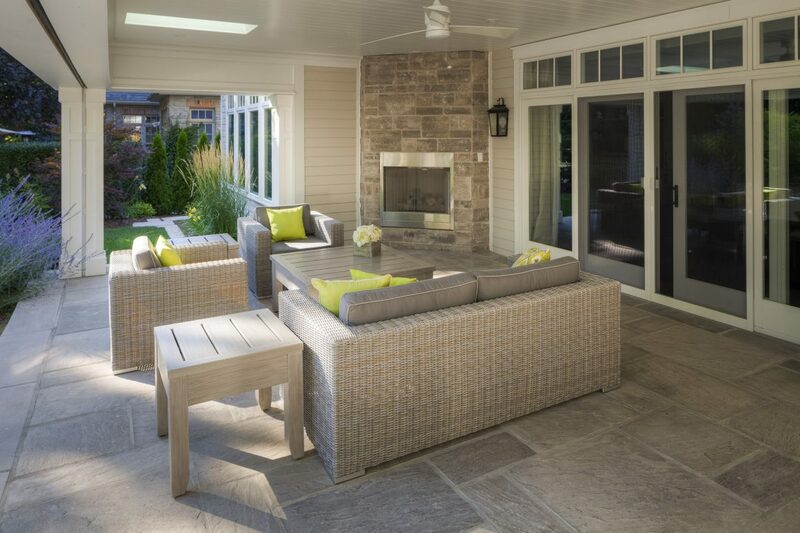 The alternative stone-and-grass part of the patio is both attractive and functional. It serves as a walkway to the adjacent lawn. “Years back, we used to use more natural stone,” says Glancy. “But we wanted to keep the patio very clean, have it flow from space to space. Each piece of precast concrete is exactly the same thickness. They are easy to level. They age better and they don’t bleach out.” Similar precast concrete veneer is used on the walls in the outdoor kitchen and for garden beds. 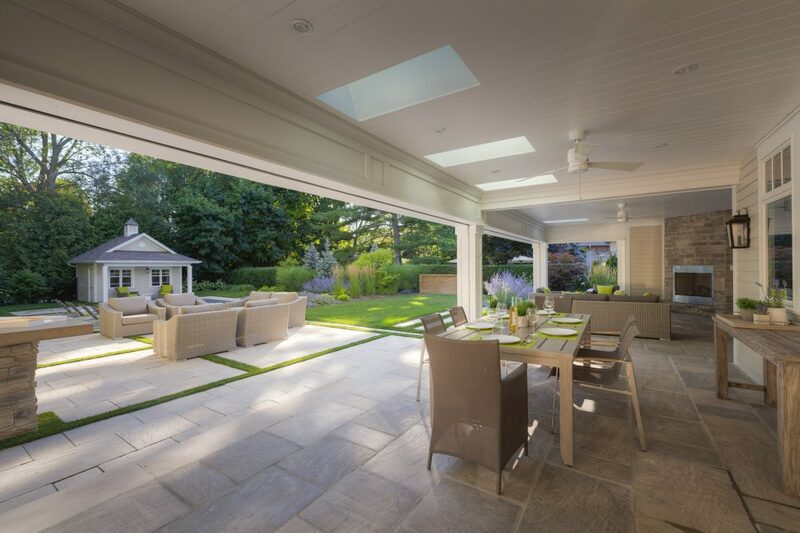 Another key design feature is a covered outdoor porch, which is accessed directly through French doors from the main living area of the house and is used for dining. 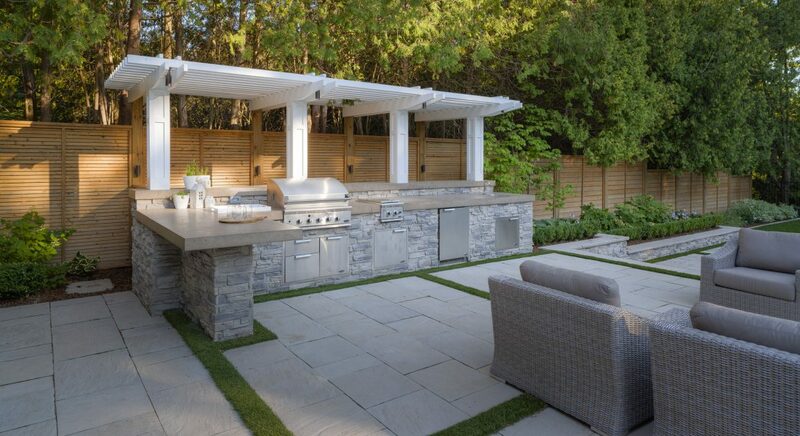 It features an outdoor stone fireplace and screen walls that are concealed and can be rolled down if necessary. “It’s an important transition space,” says Glancy. The porch extends the indoors outdoors as well as extending the outdoors to the rest of the garden. It features a tongue-and-groove wood ceiling and architectural detail on the wood posts and beams so that it marries well with the house.